With an election approaching, Israel’s government has begun discussing its strikes more openly and has also taken a tougher stance towards Hezbollah on the border with Lebanon. It said a rocket attack on Sunday was Iran’s work. 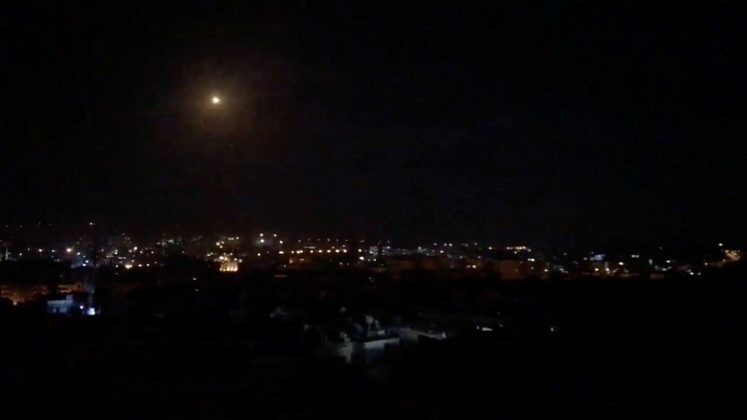 The Israeli military said its fighter jets had attacked Iranian “Quds Force” targets early on Monday, including munition stores, a position in the Damascus International Airport, an intelligence site and a military training camp. Its jets then targeted Syrian defense batteries after coming under fire. Syria said it was Israel that had attacked and its air defenses had repelled the assault. Syria had endured “intense attack through consecutive waves of guided missiles”, but had destroyed most “hostile targets”, state media quoted a military source as saying. The Russian defense ministry said Syrian air defenses, supplied by Russia, had destroyed more than 30 cruise missiles and guided bombs, according to RIA news agency. The Israeli military distributed footage of what it said were missiles hitting the Syrian defense batteries, as well as satellite images showing the location of the alleged Iranian targets. Syrian state media showed footage of explosions. In a highly publicized operation last month, the Israeli military uncovered and destroyed cross-border tunnels from Lebanon it said were dug by Hezbollah to launch future attacks. This entry was tagged Assad, Civil War, Golan Heights, Hezbollah, Iran, Missiles, Russia, Syria, United States. Bookmark the permalink.